Ammeter add-on was on my to do list for a long time. It’s important to know what current is flowing thru your CO2 tube so you don’t shorten it’s life. 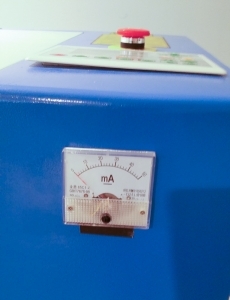 Ammeter measures current and in case of this SH-G350 machine you’ll want ammeter rated in the 0-30 or 0-50mA range because most CO2 laser tubes run under currents under 25mA. There’s extremely high voltages inside laser cutters! It can kill you in an instant. Power off and UNPLUG your machine from AC outlet before doing anything and wait for a while (at least an hour) as power supply may retain deadly voltage in the capacitors even after you unplugged it. I will not be held responsible for anything that might happen to you, so please only do this at your own risk. Also I’m not an expert and don’t have electrical engineering degree so anything I say in this article could be wrong. Please keep in mind that by making modification to your laser machine you most likely will void any warranty you might have. I highly suggest to get an analog ammeter rather then digital one. Digital ammeters are really cool, however they require separate power source (usually 5V). But that’s not a big issue. Problem with digital ammeters that they are slow so you might not even see change in current if laser pulse is short. Analog ammeters show current changes in real time. I bought a really cheap SMAKN 85C1-A DC 0-50mA ammeter on Amazon. It might be out of stock at this time, but they are pretty much the same. Just pick a DC (not AC) one in the 0-50mA range, as it will never go over 30mA mark anyway. Find a suitable place for ammeter. Make sure there’s nothing that’s already in the machine behind that space. On my SH-G350 I had plenty of empty space in the front top region so that’s where I decided to install it. Triple check that machine is unplugged and there’s no residual voltage left in power supply. 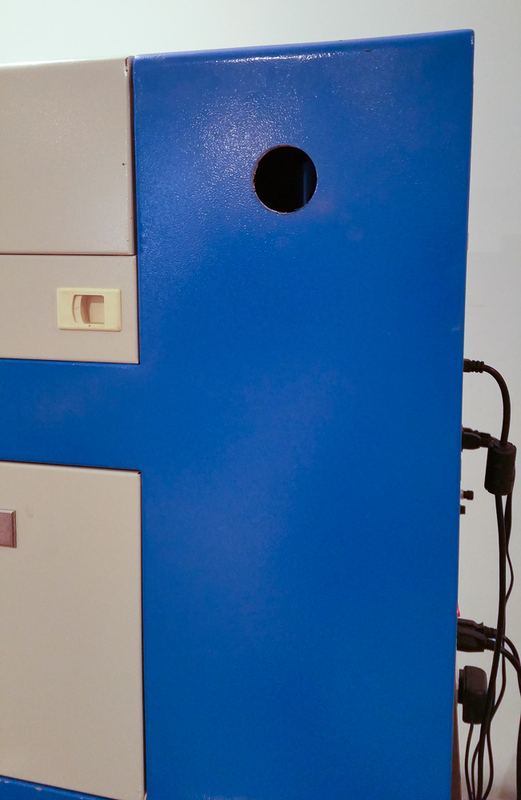 Cover power supplies, etc. inside from getting metal shavings. These might cause shorts and all kind of damage if they get inside electronics. I used paper towels to cover power supply. There are few options to attach ammeter. Some choose to make enclosure for it and attach to the outside of the case. This is non-destructive method. 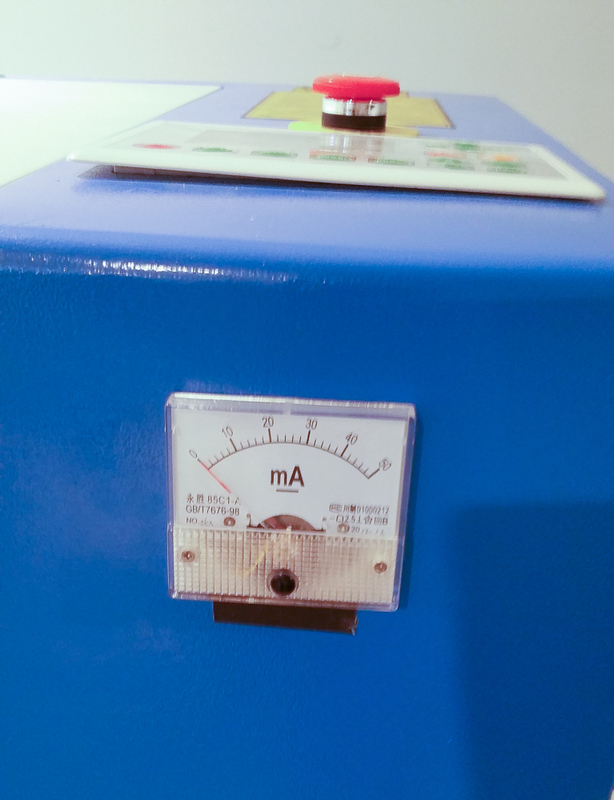 I decided to permanently install meter by drilling several holes in the metal of the laser cutter’s case. 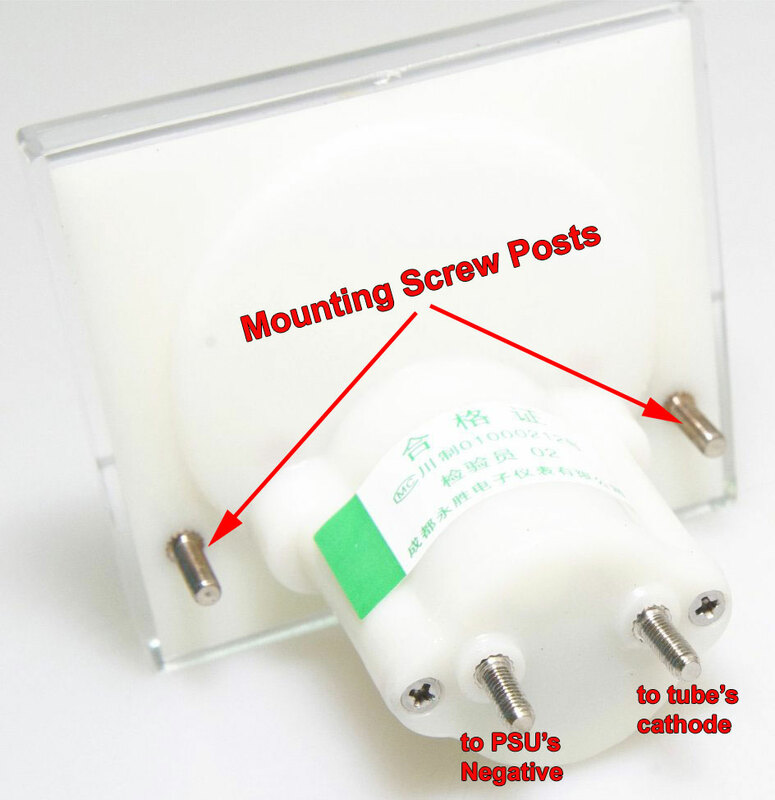 If you inspect back of the ammeter (assuming yours is same as mine), you will see a long stem with 2 screw posts where you will connect wires, as well as 2 more mounting screw posts. 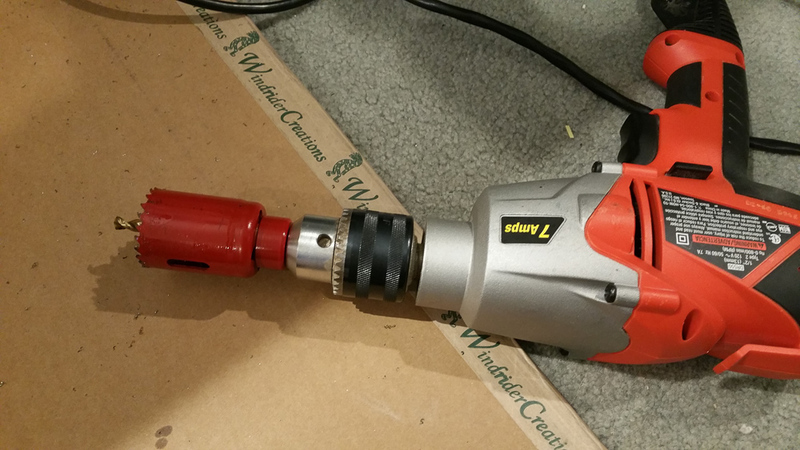 I chose to drill big hole for the “stem” and two smaller ones for the mounting screws. Unfortunately stem is oval in shape, so if you drill round hole it will leave some opening that will be visible when ammeter is installed. That’s the sacrifice you’ll have to make 🙂 Alternatively you can drill several smaller holes and file them down until they match shape of the stem. Pre-drill small pilot hole (optional but recommended). Then using your 1.5″ hole saw with pilot bit attached, drill big hole. After big hole is drilled, you might want to deburr sharp edges with file. 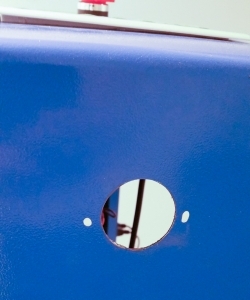 Mark spots for drilling smaller mounting holes. I put some acrylic white paint on tips of the ammeter’s mounting posts and positions it in the hole, making marks with paint on the metal. Or use any other measuring tools like calipers to find where holes should be. Pick a drill bit slightly larger than mounting screw posts and drill at marked locations. Now try and see if ammeter fits inside. In my case it didn’t because stem was slightly wider in two places. I used round file to elongate hole until meter fitted. Use vacuum cleaner to clean the mess you created and carefully remove paper towel from insides of the machine. Ammeter’s terminals usually have some kind of marking. 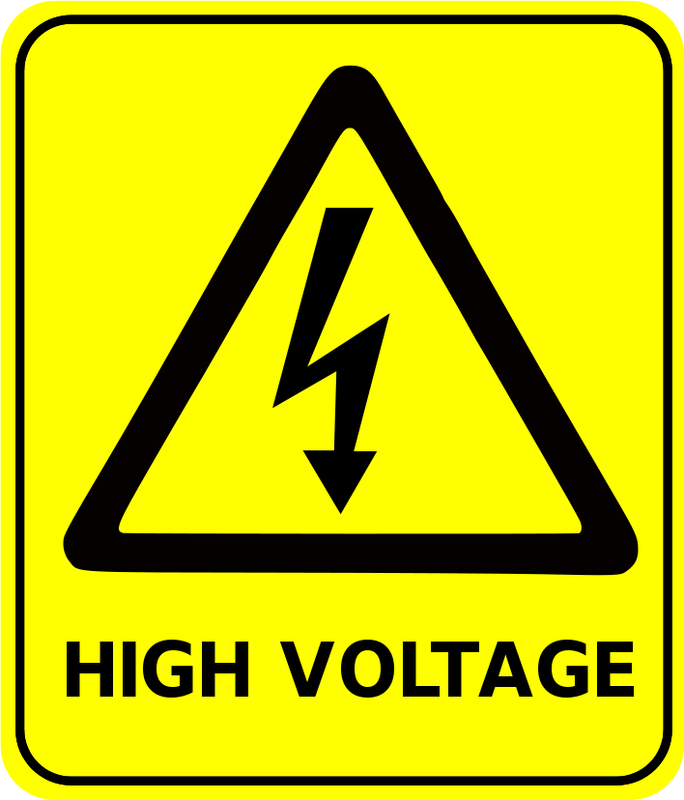 If you see “-” sign near one it means that end goes to power supply, and other goes to CO2 tube’s cathode. But if you accidentally reverse polarity, ammeter’s arrow will jump to negative space (below 0) and as long as you send very low current you probably won’t damage it. Now let’s make physical connections. Find place where negative wire from PSU spliced with wire going to CO2 tube’s cathode and cut it somewhere there, but you’ll most likely want to have a longer piece of wire coming from PSU because it needs to reach ammeter which attached in the front. But no worries if it’s too short, then you’ll just need to solder extra piece of wire (don’t use wire thinner than 20 awg) long enough to reach ammeter’s negative lead. Don’t forget to use a piece of heat-shrink tubing or electrical tape to insulate that joint. Place a washer that came with ammeter in to negative post. Take negative wire from PSU (with optional extension), strip the end, and wind around ammeter’s negative post. Insert second washer on top. Then insert spring washer and finally screw in nut until wire is held securely. Now cut of good thick wire (I used 14 AWG speaker wire), and cut it so it can reach all the way from ammeter to the wire connected to CO2 tube’s cathode. Attach it to remaining terminal of the ammeter just like wire from PSU. Strip second end and solder to the wire coming from CO2 tube’s cathode. Cover joint with electrical tape or heat-shrink tubing. Before permanently attaching ammeter, make sure that you wired it correctly and polarity is not reversed. Put it somewhere securely so it’s terminals are not touching anything. 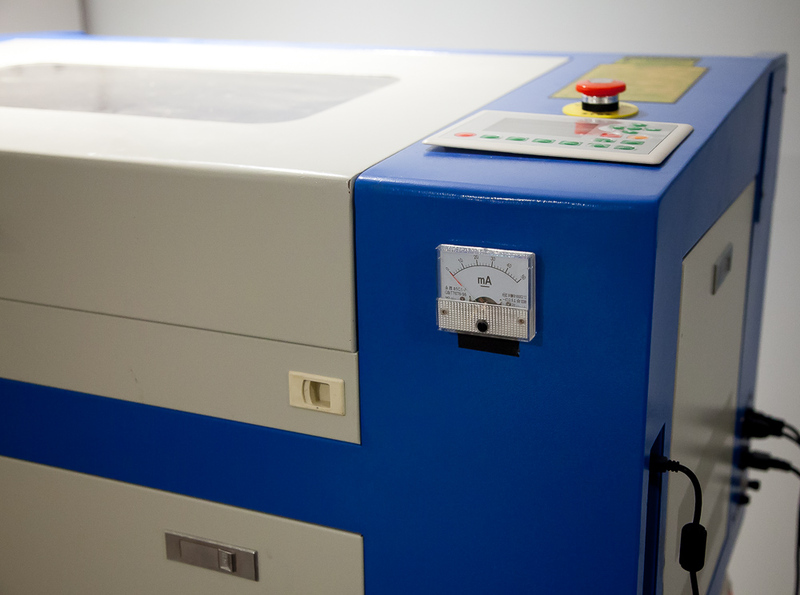 Set laser min/max to smallest possible power setting at which your machine fires. On mine it was 10%. Do a pulse and see which direction arrow on the ammeter moves. If it tries to move below zero, you wired it in reverse. If that’s the case unplug machine, wait for PSU to discharge and fix wiring issue by swapping wires on ammeter’s terminals. Step 5: Finish installation and final test. Unplug machine and wait for power to dissipate from PSU. Install ammeter using mounting screw posts, washers and nuts. I used needle-nose pliers to tighten nuts. Now test your machine and check which current you get at each power setting. Do not go above 20mA if you still have factory tube (50W machines actually come with 40W CO2 tubes). I didn’t go over 80% because my tube can’t handle it. Nah you can run it as is. Just keep an eye on ammeter, don’t go above 20mA. If it shows 20 mA at 65% power, that’s your ceiling. so, what 60w tube do you recommend? How do you know what the limit is of your tube? I have a 50w tube which I’m pretty sure I killed today by running it at 80% power for long periods of time. I have no idea what my power supply is rated (?) at, or if there is even a way to figure that out? Great! Thanks for the advice. Now I hope when I get the new tube, that is the problem and not my psu…nervous. I mean beyond the heat shrink. Like silicone maybe? Actually to find out what your max mA you can run on you tube look on the tubes manufacturing site for the model and it will guide you in the right direction. Like mine came w/ a LS SEA tube model F4 they say no higher than 30mA but for best tube life stay around 28mA.